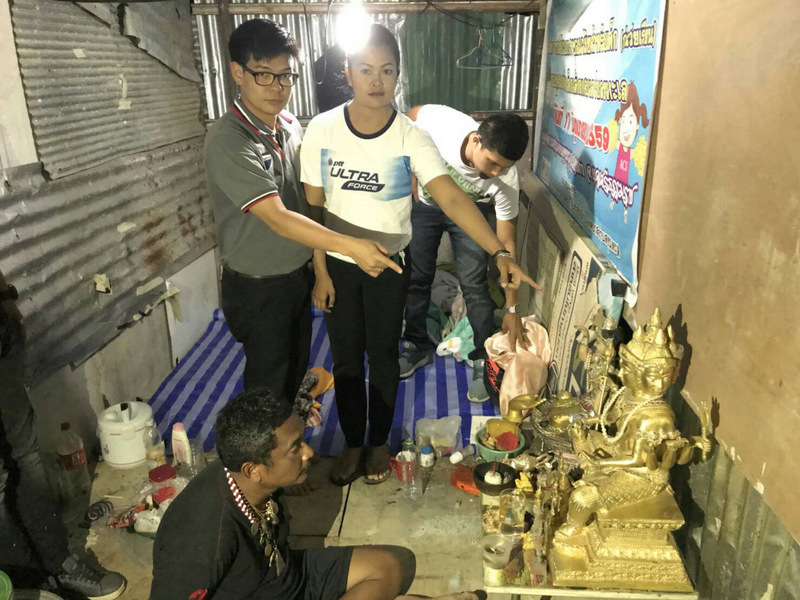 PHUKET: A construction worker has been arrested for stealing a revered four-faced “Phra Phrom” statue from a shrine at a petrol station in Srisoonthorn early Tuesday morning (July 3) in the hope that he could sell it to pay his bills. 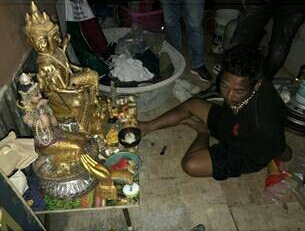 However, stealing an image of the Hindu god of creation Lord Brahma – regarded in Thai culture as a deity of good fortune and protection – didn’t work out so well for 47-year-old Montri Sawetdul. Thalang Police arrived at his room at a construction workers’ camp in Srisoonthorn at 7pm last night (July 4) and placed him under arrest. Seized as evidence at the scene was the Phra Phrom statue and the three yellow plastic garlands adorning it. 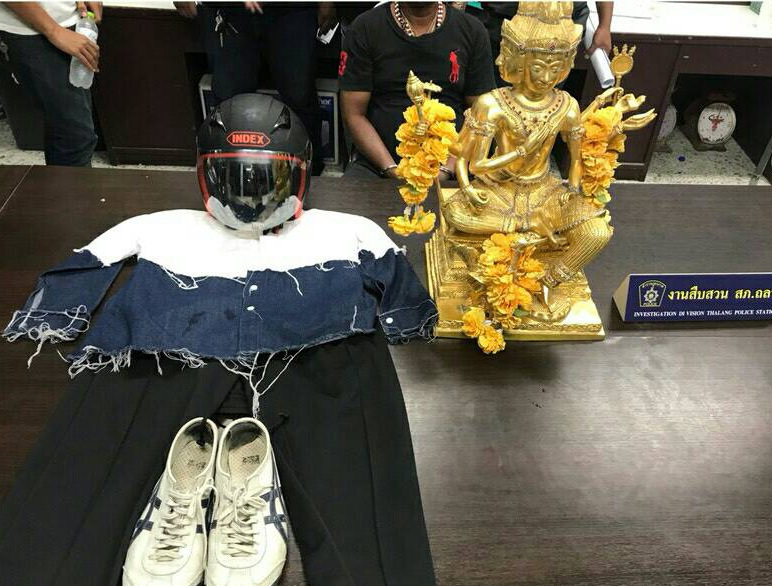 Also seized were Montri’s blue-black Honda Wave motorbike, his helmet, and the blue-white shirt, black pants and even the white pair of shoes he was wearing when he stole the statue. 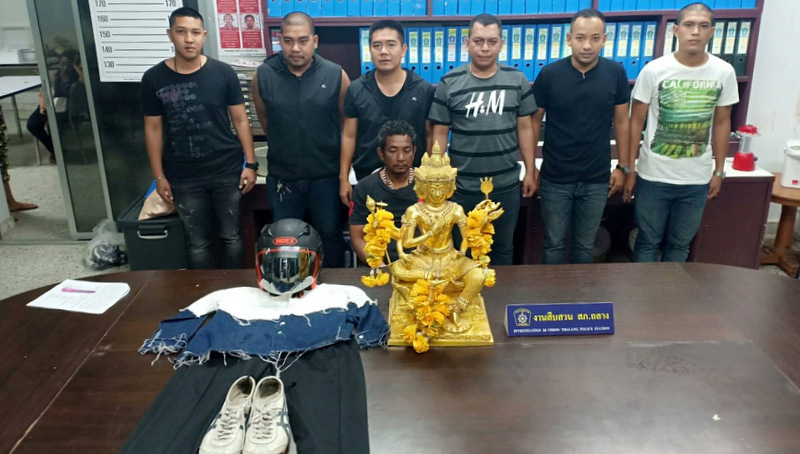 Lt Col Nathapob Pongsaparn of the Thalang Police explained that his officers were notified of the theft by Surarak Hatsapak, 36, at 1:40pm on Tuesday (July 3). Ms Surarak explained that the statue had been stolen from the PPT Jomthong petrol station in Muang Mai, Thalang, at 3:55am that day. The entire incident was recorded on CCTV, she noted. Officials began their search for the thief, and by last night had their man in custody. “The suspect confessed that he he stole the statue and that he wanted to sell it for money to pay his daily expenses,” Col Nathapob said. Montri was taken to Thalang Police Station and charged with committing theft at night, Col Nathapob added. So many police men on the picture.All for a short moment of fame.Hope they are not only sitting in their armchairs after  that again. Brains galore in this story. Not only the genius that tried stealing this good luck totem...but also the people that really buy into the idea that a ceramic painted statue with plastic  garlands is actually going to bring anything to anyone...including successful future to a gas station.